Reductions in the Amount of Available Habitat - SOTSP. Critical tributary habitat functions and processes have been limited, and in some cases eliminated, by direct blockage of access (tributary and mainstem) by hydropower and irrigation projects. Chief Joseph, Hells Canyon, and Dworshak dams are high head projects that are impassable to anadromous species from the Upper Columbia, Snake, and Clearwater rivers, respectively. Chief Joseph Dam blocks access to 1,100 miles of Columbia River mainstem and tributary habitat, and Hells Canyon Dam blocks access to 600 miles of Snake River mainstem and tributary habitat. Together Chief Joseph, Hells Canyon, and Dworshak dams in the Columbia River Basin block more than 55% of historical tributary and mainstem habitat for anadromous fish (NPPC 1986; adjacent Figure 3.6). In addition, tributary dams which are impassable and block hundreds of miles of habitat include Condit in the White Salmon Basin and Enloe in the Similkameen River, located in the Okanogan River Subbasin. Additional reductions in habitat have occurred in the mainstem. Many chinook salmon populations historically spawned in the mainstem Columbia and Snake rivers. Except for the Hanford Reach, the Snake River between Lower Granite Pool and Hells Canyon Dam, the Lower Clearwater River, and a few other locations, these mainstem spawning areas have been considerably reduced by the construction of hydroelectric dams. The amount of habitat available to chinook, coho, and sockeye before water developments blocked access to streams and before habitat was degraded relative to the present is shown in Table 3.3. Habitat has also been eliminated by excessive water withdrawals for irrigation, which effectively de-waters portions of watersheds. Habitat has also been eliminated by elevated temperatures which have forced fish to rear only in the cooler waters of the upper portion of watersheds. In addition, passage is impeded by poorly designed, maintained, and operated structures and facilities and by reductions in the amount of water available for passage. Although both Oregon and Washington require screens at diversions on fish-bearing streams, surveys of the pumping stations in the Columbia River Basin indicate that 70-80% of Oregon sites and 50% of those in Washington are poorly maintained, damaged, oversized, or entirely absent (ODFW 1993; CBFWA 1994). 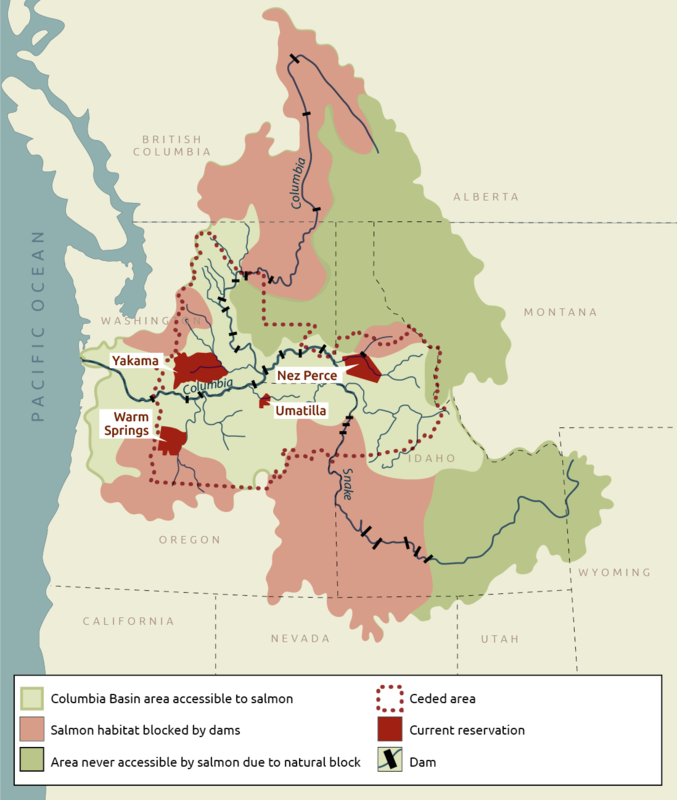 Tens of thousands of salmon smolt can be lost at these sites (e.g., an estimated 58,000 juvenile salmon were annihilated at a small, private hydropower facility near Hermiston, Oregon, where a torn screen allowed fish to pass through turbines in March 1994). Idaho has even less compliance. Where access to tributaries has been blocked or constrained, anadromous fish populations often become fragmented. Fragmentation of these historically interconnected salmon stocks resulted in the development of numerous smaller subpopulations that have an increased risk of becoming extinct. In much of the remaining high-quality habitat, stream systems are often punctuated with segments of poor or unsuitable habitat. This effectively relegates both anadromous and native resident native fish to disconnected areas of good habitat. Overall survival is further reduced by overwintering habitat that is either nonexistent or poor in quality. Extensive losses of habitat have occurred in the Columbia River Estuary as a result of dredging, filling, diking, and channelization. Estimates from 1870 to 1970 indicate that 20,000 acres of tidal swamps (with woody vegetation; 78% of estuary littoral area), 10,000 acres of tidal marshes (with nonwoody vegetation), and 3,000 acres of tidal flats have been lost. Further, major projects of the U.S. Army Corps of Engineers to aid the annual navigation of more than 2,000 ocean vessels continue to alter the shape of the estuary (Simenstad et al. 1990). Figure 3.6 Available and blocked salmon habitat in relation to tribal ceded area.